MANILA, Philippines – President Benigno Aquino III said the family of the late strongman Ferdinand Marcos should apologize for the atrocities committed during martial rule. An apology would have been enough for the Filipino people, who are known to be forgiving, Aquino said at the presidential forum of the Foreign Correspondents Association of the Philippines (FOCAP) on Tuesday, October 27. Aquino was asked if he believed that the Marcoses have something to apologize for, in reference to the human rights abuses committed during the Marcos regime. “I’ve said that time and again for many decades, yes….The start of a solution is the admission of the problem, of the crime that begets the problem,” said Aquino, whose father, the late Senator Benigno “Ninoy” Aquino Jr, was among those detained upon the imposition of martial law. He questioned the Marcoses’ denial of human rights abuses committed during martial rule, as he recounted the experience of not only his own father but former household employees as well. His father was detained for 7 years after martial law was declared in 1972. Their former family driver and his wife, who both worked for them prior to the imposition of martial rule, were detained just because of their association with the Aquino family. “If there’s a denial of what happened, is there also a statement that there is no recognition that things have to be corrected down the line? And therefore is there a promise that there will be no repetition of the same? That is our question,” Aquino said. 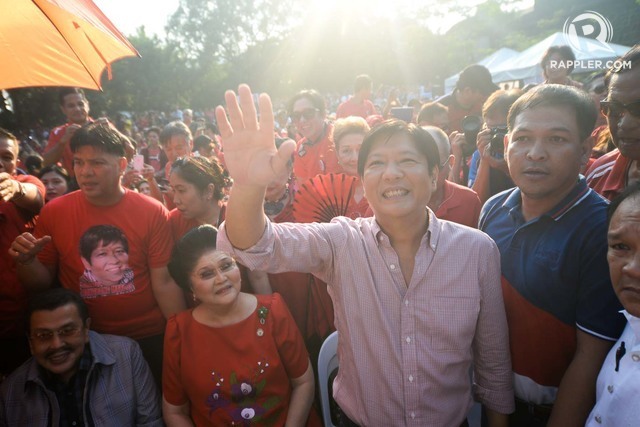 Marcos’ son, Senator Ferdinand “Bongbong” Marcos Jr, is running for vice president in the 2016 elections. The senator had repeatedly said he is lucky to be the “son of a president who has done so much” and believed there is nothing his family should apologize for. Aquino said proof of the abuses committed during martial rule is the Human Rights Compensation Law . Aquino, however, expressed hope that the cases of human rights abuses filed by the claimants under the law would be studied by future generations so they would not forget the country’s dark days of human rights abuses perpetrated during martial rule. “Leave it for the future generations to study what transpired in the hope that it can be avoided down the line,” he said. Responding to questions, Aquino downplayed the seeming “resurgence” of the Marcoses reflected in numerous posts in social media and the Internet glorifying the Marcos regime. “There is a resurgence of support? No, no. I think the answer to that is very obvious. I don’t think so,” he said. “I have faith in my bosses, the Filipino people. There was nothing that has caused me to change the faith that they are able to discern,” Aquino added. Further proving his point, Aquino compared Marcos’ presidency to his term. “I think what we should demonstrate or what should be highlighted is the fact that there is a period in time that contrary opinions were not encouraged. In our watch, contrary opinions are part and parcel and protected in the democratic space that we have managed to really strengthen within our watch. That is, I think, proof that the democratic system in this country works,” Aquino said.